The Spartans fall to the Wildcats, but advance to next week's 5A state playoffs. 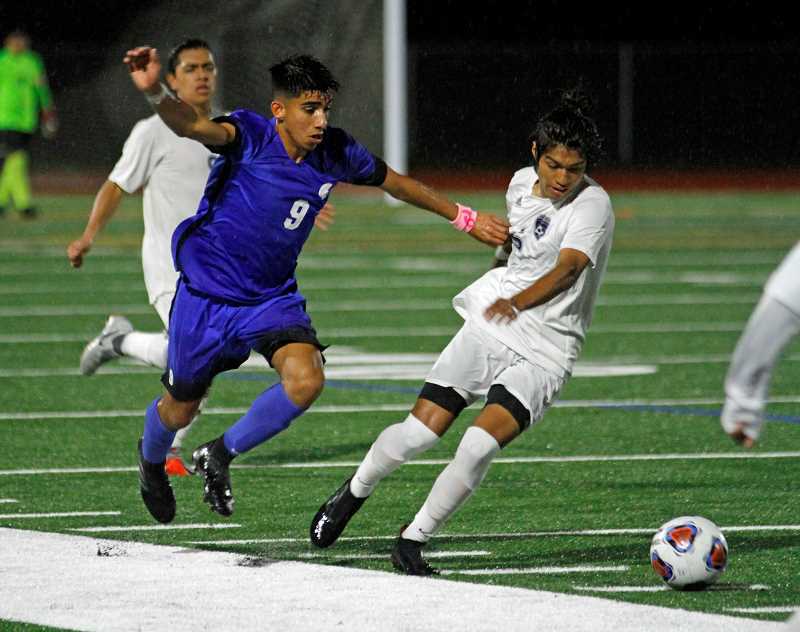 The Hilhi Spartans boys soccer team had won four of their last five, and was a home win over Wilsonville in their regular season finale away from hosting a first round playoff game. But like the famous saying adapted from a line in "To a Mouse," by Robert Burns; "The best-laid plans of mice and men often go awry." The Spartans allowed two first-half goals and failed to mount a serious second half charge en route to a 2-0 loss to the Wildcats in a driving rain storm, Oct. 25, at Hillsboro High School. "Wilsonville came at us right away, and I expected that and we talked about being able to absorb their pressure and putting it back on them," said Hillsboro head coach Stuart Hoiem. "But from the first touch of the ball, we just didn't have it. They put us under constant pressure and we lost our heads." The Wildcats pressured from the start, dominating the ball and keeping it in the Hilhi end for the bulk of the first half. They missed on a few different opportunities in the first 25 minutes, but connected in the 36th minute when Ruben Lopez Camacho cracked a liner from roughly 30 yards, over the Spartan keeper's head and into the upper left portion of the net for the game's first goal. They wasted little time getting their second goal, scoring again a minute later when forward Damien Foster beat Hillsboro goalie Pablo Mendoza Osornia to a loose ball and blasted it past the diving keeper into the right portion of the net, making it 2-0 and changing the outlook for a Spartans team struggling for answers. "That second goal was huge," Hoiem said. "To give up the one, that was a problem, but credit to that guy for hitting a good shot. But to check out and give up that goal minutes later was pretty close to a backbreaker." Wilsonville head coach Ian Reschke agreed with Hoiem's assessment and spoke to the changing mindset in the wake of the 2-0 lead. "That was huge," said the Wildcat's coach. "If that game's going 1-0 the rest of the way, it's a coin flip to be honest. Even 2-0 we were still nervous, because if they get one on us then our backs are against the wall and defending. So yeah, it was a big goal." Hoiem noted Wilsonville's aggressive style and spoke to his team's inability to match it. In addition, he also wasn't surprised by their approach, based on their history of games against the Wildcats. "They probably executed their game plan the way they wanted to, and that's been pretty consistent with how they've played us in the past," Hoiem said. "That immediate high pressure is a style which we struggle with." Reschke couldn't help but agree with Hoiem's assessment. But he also said they did so not so much out of habit, but more so out of the desperation stemming from their need for a positive result. The Wildcats needed a win or tie to qualify for the postseason, and due to such played like it. "We had to be aggressive," said Reschke. "It was purposeful and we were taking risks putting more kids upfront, but we couldn't just wait around. We had to take a chance and they almost caught us a couple times on the counter, but we were able to get in their way and it worked out." So with the playoffs up next for the Sparts, what can Hillsboro take from the defeat? Not much it seemed. But Hoiem said it's important his kids flush the result from their memory and concentrate on the upcoming task at hand. "I stressed to the kids to put the negativity behind us and that we can only focus on the positive. If anyone is going to be worried about what happened it's only going to hold us back," said the coach. "We need to get our heads cleared and going in the right direction. We'll be on the road and we've played in some tough environments, and if they're ready and approach it with the right frame of mind, we'll be okay." Hillsboro's first round opponent, Oct. 30, has yet to be determined.